Palace Square is a large open square surrounded by historical building in the center of St Petersburg. There are a number of key landmarks in the square; Alexandar Column, Winter Palace, the General Staff Building and the Guard Corps Headquarters. In the photograph below the general Staff Building and Alexandar Column are visible. Alexandar Column is a single red marble slab and creates a tower 47m high, the highest of its kind anywhere in the world. 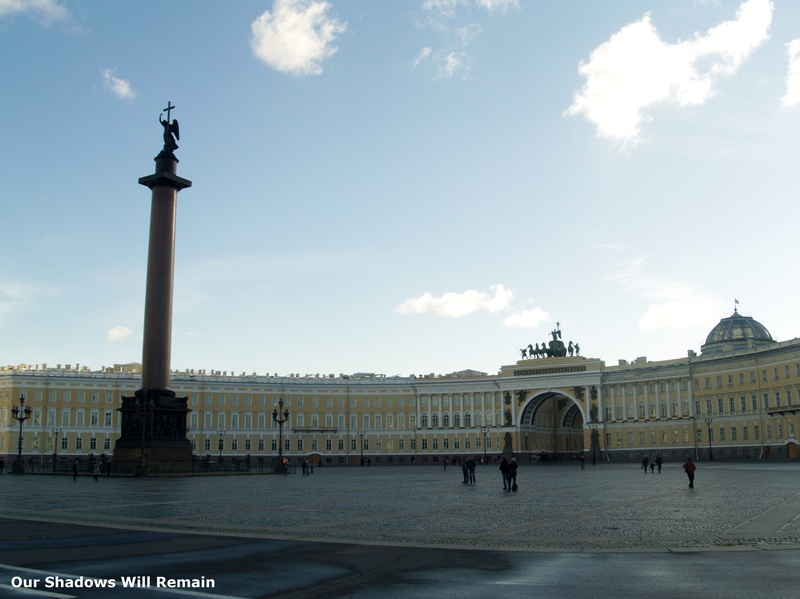 The General Staff Building forms an arch on the southern side of the square and faces the Winter Palace. Joining the two buildings is a decorative arch topped with the Goddess of Victory riding a chariot to represent the victory over Napoleon in 1812. In 1905 the square was the site of the Bloody Sunday Massacre that would eventually result in the Russian Revolution of 1917. See the archway in more detail in my gallery from St Petersburg. The Church of the Savior on Spilled Blood in St Petersburg was built on the site where Alexander II was wounded resulting in his death in March 1881. While travelling passed this area a gernade was thrown under the carriage of Alexander II, it was a secondary blast that mortally wounded him. Construction began in 1883 under Alexander III, his son, and finished in 1907 under Nicholas II. 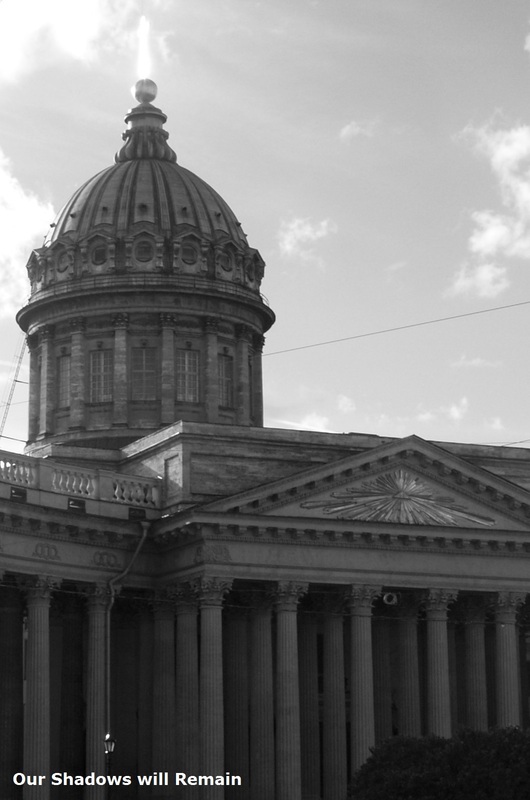 For more from my travels in Russia see my post St Petersburg. For an example of Russian architecture that is very different to this click HERE. From Helsinki there are ferries leaving daily for places such as Tallinn, Stockholm and St Petersburg. If you keep your eye on the websites you can usually find a very tempting deal. I had been to Stockholm and Tallinn numerous times in the past, it was now time for something different, St Petersburg. With a change in policy ferry passengers are now able to visit the city without the need of applying for a visa in advance. Russia was always somewhere I wanted to go but people often I was told bad things to say about it, “You will find it impossible there without knowing the language,” or “You will get robbed,” but St Petersburg was completely the opposite. We were able to walk around the city safely and freely, had no trouble ordering in the many cafes we visited during the day. The only difficult situation was passing through the passport control after disembarking the ferry. One of the main places we stopped at while exploring the city was Palace Square, home to, obviously, the Winter Palace, Alexandar Column and the General Staff Buildings (pictured above) connecting by a beautifully decorated archway. Next stop the Church of the Savior on Spilled Blood. The architecture in St Petersburg really did surprise me, it was very similar to Helsinki and Stockholm apart from the Church of the Savior on Spilled Blood but you can still see similarities in Helsinki’s Russian Orthodox Cathedral. I expected to see more concrete buildings typical from the period of Soviet Union but most buildings in the centre predated that time. It wasn’t until getting back to the ferry port that I found a good example. 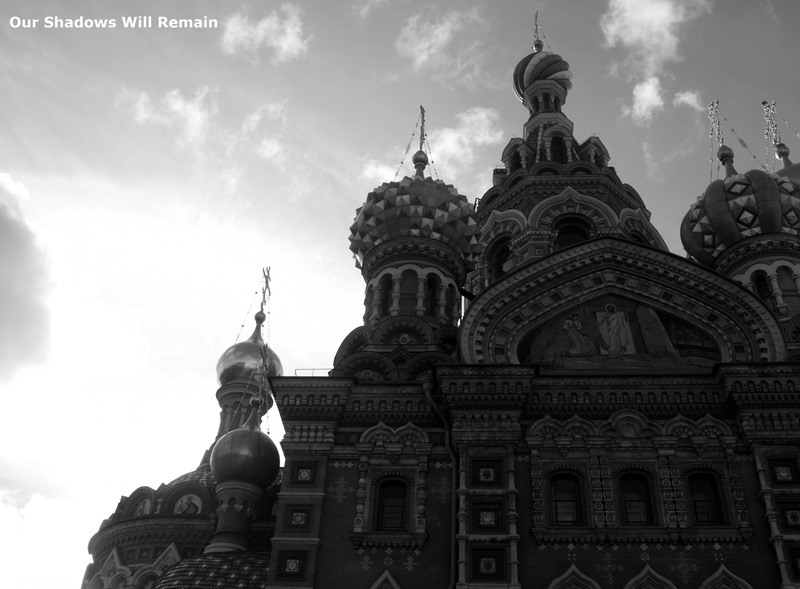 See the gallery below for my photographs from St Petersburg.